Ramban suggest that this expression is reserved for righteous persons. Our main concern is with the two two-word phrases that follow, describing Avraham at the time of his death. The first, , translated here as "in a good old age", is also rendered by English translations as "at a ripe old age" (CJB and NASB), "at a happy ripe age" (NJB) and a number of other combinations. The word can mean "grey hair", a physical indication of age. The second phrase, , here given as "an old man and content" is rendered "an old man and full of years" by many translations; the root means to be satisfied or to be filled (Davidson), the 'years' being implied by Avraham being an old man. Although Nahum Sarna points out that "such a summation of a life is found with no other personality in biblical literature", Nachmanides suggests that a similar sense is given of Yitz'khak - "an old man and full of days" (35:29) - and David, "in a good old age, full of days" (1 Chronicles 29:28). Sarna comments that, "the phrase describes not his longevity, which is otherwise mentioned, but the quality of his earthly existence." Hirsch claims that "he had reached all that was possible to attain spiritually and morally and in his external life, the fulfillment of his wishes. Our sages take this word to describe death in terms that think of death more deeply and more beautifully that have ever been expressed as a human thought." Hirsch refers us to two important ideas found in the Midrash. Quoting several verses from the Psalms, ending with "How great is Your goodness, which You have stored up for those who fear You" (Psalm 31:20, CJB), Rabbi Judah said, "The entire reward of the righteous is kept ready for them for the Hereafter, and the Holy One, blessed be He, shows them while yet in this world the reward He is to give them in the future; their souls are then satisfied and they fall asleep." 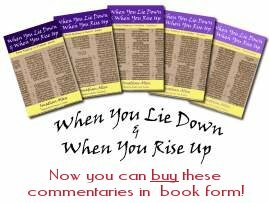 Very similarly, Rabbi Eleazar says: "So does G-d show the righteous while yet in this world the reward which He is to give them in the future, and thus they fall asleep with satisfied souls" (B'resheet Rabbah 62:2). This affirms a conviction in the resurrection and a life in the world to come, and that there is a reward for each person when they get there. This is consonant with Daniel's last vision: "Many of those that sleep in the dust of the earth will awake, some to eternal life, others to reproaches, to everlasting abhorrence" (Daniel 12:2, JPS). Unusual to the Christian ear is the suggestion that G-d allows the righteous a glimpse of their next-world reward while they are still here. At the same time, many pastors and others can tell stories of people at the end of their lives who were just "ready to go", if not "waiting to go". There comes a time when, despite relationships and all sorts of things that will be left behind, believers are simply ready to go home and they have an assurance based on knowing where they are going and who they are going to be with that it's time to move on. The second idea comes from the same portion of the Midrash. After telling two slightly different versions of a parable about a man who grows figs getting up very early in the morning to pick the ripe fruit before the sun gets on it, the Sages comment, "'Well does the owner of the fig-tree know when it is time for the tree to be plucked, and he does so.' Similarly the Holy One, blessed be He, knows when it is the right time for the righteous to depart from the world, and then He removes them." Examples from the Bible are Enoch - "All the days of Enoch came to 365 years. Enoch walked with G-d; then he was no more, for G-d took him" (B'resheet 5:23-24, JPS) - and Elijah: "As [Elijah and Elisha] kept on walking and talking, a fiery chariot with fiery horses suddenly appeared and separated one from the other; and Elijah went up to heaven in a whirlwind" (2 Kings 2:11, JPS). In the same way, G-d - who numbers each of our days (Psalm 39:5) - determines the time when we shall pass from this world to the next. We shall not go one moment too soon or too late. As Yeshua said, "Are not two sparrows sold for a penny? And not one of them will fall to the ground apart from your Father" (Matthew 10:29, ESV). Rav Sha'ul seems to feel something of the same when he expresses his own dilemma: "I am hard pressed between the two. My desire is to depart and be with Christ, for that is far better. But to remain in the flesh is more necessary on your account" (Philippians 1:23-24, ESV). He knows that he cannot exercise that choice, it is the prerogative of G-d alone, so concludes that he will remain and continue working with the Philippians. G-d has given us an imperative to save life, not to end it, including our own! After Lazarus died, Yeshua and the disciples went to see Martha and Mary, Lazarus' sisters. Martha meets Yeshua on His way into the village and chides Him for not coming sooner, so that Lazarus might not have died. Yeshua tells her that her brother will rise again and she gives Him a good, honest, faith response: "I know that he will rise again at the Resurrection on the Last Day" (John 11:24, CJB). She believes that; it was standard teaching of the Pharisees in Second Temple Judaism - Daniel's vision again. But that doesn't help her now; Lazarus, her brother and probably the bread-winner and protector of their family, is still dead. She knows it and so does Yeshua. So Yeshua pushes straight back at her: "I AM the Resurrection and the Life! Whoever puts his trust in Me will live, even if he dies; and everyone living and trusting in Me will never die. Do you believe this?" (vv. 25-26, CJB). "But how far do you believe," He asks her, "can you go a step further?" But Martha blinks - "Yes, Lord, I believe that you are the Messiah, the Son of G-d, the one coming into the world" (v.27, CJB) - she can't look Him straight in the eye. She's not ready. Earlier in His ministry, during a debate in the synagogue at Capernaum when emotions were starting to run high, Yeshua told the crowd, "This is the will of the One who sent me: that I should not lose any of all those He has given me but should raise them up on the Last Day" (John 6:39, CJB). The Father has sent the Son to raise up everyone who believes in Him on the Last Day. Then He says it again, "Yes, this is the will of my Father: that all who see the Son and trust in Him should have eternal life, and that I should raise them up on the Last Day" (v. 40, CJB). Yes, you heard. But the crowd can't look Him in the eye either; they think they still see just the carpenter's son. They're not ready. Then Yeshua turns to the disciples - "Are you going too?" (v. 67) - who leave Simon Peter to answer for them, "Lord, to whom would we go? You have the word of eternal life. We have trusted, and we know that you are the Holy One of G-d" (vv. 68-69, CJB). Peter's got his fingers crossed behind his back. He's not ready either. If you discovered that you were to die tomorrow, what would your expectations be? Would you die at a good old age - whatever that might mean for you - full of days and content? Are you ready to take the Master's hand and walk with Him into the next world when He calls? Can you trust Him with your family, friends and finances, believing that He knows exactly when the time is right? Do you have the faith and assurance of Avraham? 1. - Keturah is identified in some Jewish traditions as Hagar, but this is also denied by many of the classic commentators. Application: Who do you see when you look at Yeshua? The Jewish rabbi? A prophet or teacher? Or do you see the one in whom "all the promises of G-d are 'Yes' and 'Amen'"? (2 Corinthians 1:20). It's time to look Him straight in the eye and know that He means what He says and that you can trust Him. 17:41 03Nov15 Tom Hiney: I think that Job's blessing in 1:21 is just right, viz "The L-rd has given. The L-rd has taken away". G-d will decide when each of us goes, and when the time is right.